"The reader is entertained by the journey of another, but the writer is the changer of worlds." Deep in the New Mexico desert is a dormant volcano with a tiny cleft carved into its side. Underneath that volcano lies a massive cavern and the cracked, decaying ruins of a once-great empire that spanned thousands of worlds and even more years. It was the home of the D'ni, and it has lain still for hundreds of years. It was only in the late '80s that it was discovered by the surface world, and since then the D'ni Restoration Council, a privately funded archaeological organization, has attempted to excavate the cavern and restore the empire to its former glory. In the early '90s, the archaeologists in charge of the expedition wanted to increase exposure for the project. They approached a small development studio, Cyan, with exclusive exposure to D'ni culture and history and asked them to create a game that would teach the world about a forgotten people. That game, based on historical documents dating back to the early 1800s, told the story of a quarter-D'ni named Atrus and became the vanguard title of the CD-ROM era, Myst. Released in 1993, Myst quickly became the best-selling game of its time. Its vividly detailed graphics and (no pun intended) mysterious atmosphere made it a showcase for the power of the CD-ROM. Cyan was allowed more access to D'ni materials and history, even to the cavern, soon after Myst's release, which led to Riven, known for its even more difficult puzzles and fantastic attention to detail. Around the same time, the DRC was officially formed. 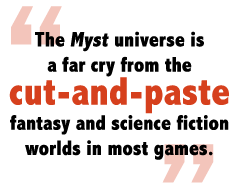 Of course, D'ni, the DRC and the volcano in New Mexico don't actually exist, but for the players of Myst Online: Uru Live, Cyan's contribution to the MMOG boom, that history is reality. They are the explorers that have been called to the D'ni cavern to witness and assist the restoration of the empire. It's a fiction they take very seriously. The Myst universe is a far cry from the cut-and-paste fantasy and science fiction worlds in most games. There are no elves, no sorcerers, no orcs. Instead, the aptly named Cyan Worlds has crafted an entire society with a fleshed-out history and culture. The D'ni were a patient, contemplative people that were masters of the rock that surrounded them. They were also proficient in "the Art," both the central aspect of D'ni existence and the central conceit of the Myst series. The Art was the ability to craft descriptive books that would in turn "link" to the worlds described therein. If you could describe it, you could link to it. In addition, they had their own numerals, language, alphabet, religion, guild system and economy - all with no concrete relation to surface cultures. The consistency and plausibility of Cyan's creation is astounding. For example, explorers realized that the D'ni alphabet was actually a "cursive" version of the numeral system; it feels like something that developed over thousands of years. This verisimilitude is the work of official Cyan "D'ni Historian" Richard A. Watson, whose fancies end up as D'ni canon. In true Myst fashion, he is extremely tight-lipped. Most everything the community knows they have gleaned themselves by poring over the games and novels for more than a decade. Groups dedicated to the linguistics of the D'ni language must, for example, deduce the language's structure and rules from less than 100 full D'ni sentences released by Cyan.